Aromatherapy is the use of essential oils to alleviate pain, encourage healing and promote a sense of well-being and relaxation. Originally employed by the ancient Egyptians, essential oils are produced either by distillation or by extracting the essence from plants and flowers. 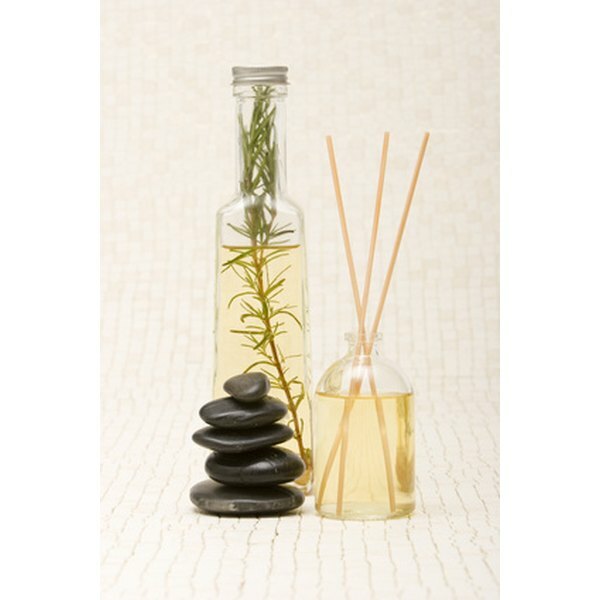 The oils can be used in a number of ways: by placing drops in the bath or a burner, by inhalation, or mixed along with other oils and a base oil for use in massage. Rosemary (Latin name Rosmarinus officianalis) has long been known for its restorative properties. Rosemary is a stimulant and often used as a "wake-up" oil. As an anti-inflammatory, it is ideal for use as a massage oil, particularly in cases of muscular pain and rheumatism. Because of its astringent properties, rosemary stimulates the circulation, increasing the flow of blood to the muscles, and warming the area being massaged, which helps to reduce inflammation and relieve pain. One note of warning: Rosemary should never be used in pregnancy or by someone who suffers from epilepsy or high blood pressure. Roman Chamomile (Latin name Chamaemelum nobile) is another essential oil that has been in use since ancient times and was known to the Saxons as one of their nine sacred herbs. This gentle and versatile oil is effective in the soothing of painful joints, muscular aches and pains, sprains, rheumatism and neuralgia. Chamomile is the most calming of oils, and its sedative properties help to ease pain as well as inflammation. This oil can be used safely on the skin and can even be effective in relieving teething pain and toothache. Ginger (Latin name Zingiber officinale) is an oil used for many different purposes. The herb is used extensively in cooking and is valued for its qualities of soothing and settling the digestive system. A warming and comforting oil, when employed in massage, it is effective in treating arthritis, fatigue, muscular aches and pains, poor circulation and strains and sprains. It has a similar action to rosemary in that it stimulates the blood flow and warms the skin, bringing relief from pain and stiffness associated with inflammation. Tea tree oil (Latin name Melaleuca alternifolia) comes from Australia and has long been used by the aborigine Australians for its many medicinal properties. As it is antiviral and antibiotic, it is a good oil to use when the skin is inflamed. A few drops in the bath will help stimulate the body’s own immune system against infection and help to calm inflammation. For this reason, the oil is a useful tool in the fight against skin conditions such as acne and pimples, and infected wounds.